Professor Ōhashi Kōji, Director emeritus of the Kyushu Ceramic Museum, and Sotheby’s Senior Fellow of the Sainsbury Institute for 2012 travelled to England twice in 2012 in order to conduct research on the British Museum’s extensive collection of Japanese ceramics. Professor Ōhashi has worked at the Kyushu Ceramic Museum since its foundation in 1980 and his own research reflects this important museum’s history. He spoke to us about the Kyushu Ceramic Museum when we met in London shortly before Christmas. ‘The Kyushu Ceramic Museum is located in Hizen Province in Kyushu, which became a centre of ceramic production in the early 17th century. 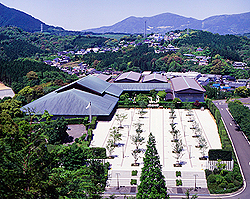 As only the second museum of its kind in Japan specialising in ceramics (with the Aichi Prefectural Ceramic Museum), it was a unique institution in 1980. We display distinctive works from each ceramic production area of Kyushu, examining and showing the industry from a broad perspective including displays that reveal the active trading relationships which existed with the Chinese Continent, Taiwan, South East Asia and Europe. Our core collection has been formed mostly through generous donations, among the most prominent being that from Mr. and Mrs. Shibata who gave the museum more than 10,000 porcelain works. 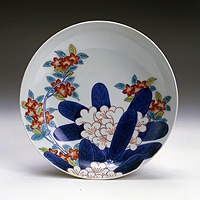 The Shibatas were similarly generous to the British Museum, donating 500 porcelains from their collection of Koimari style wares, made in the Arita area kilns during the Edo period. In the Kyushu Ceramic Museum, Mr. and Mrs. Shibata’s collection is allocated a dedicated exhibition space, which displays around 1,000 ceramics with an annual rotation. Other exhibition areas in the Museum include spaces dedicated to early ceramics found in Kyushu, the History of the Ceramic Industry in Kyushu and Contemporary Ceramics by artists who currently reside in Kyushu. When the museum was created and I first began my work as a curator, my research focused on ceramics from Hizen province. I examined thousands of ceramic shards in order to build an accurate picture of production areas and developmental timelines. The first real breakthrough in my study of Hizen Japanese porcelain occurred when I curated a show at the Kyushu Ceramic Museum in 1984. Research for this exhibition allowed me to understand the nature of Hizen porcelain excavated throughout Japan. As a result I was able to forge connections with archaeologists and visit their sites across the country. In 1989, as a museum led research project, we started to widen our area of study from an earlier focus solely on Japan to one that examined Hizen wares exported to India and Southeast Asia. This study eventually took me to Europe where I managed to identify Hizen porcelain imported by the Dutch East India Company. Ultimately the research bore fruit in a 2010 symposium on Early Modern Kyushu ceramics, entitled ‘Sekai ni yushutsusareta Hizen tōji’ (Hizen ceramics exported around the world). My latest research focus is to explore the connection between the production of Hizen porcelain and the Tokugawa government. 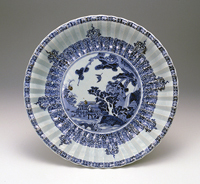 Porcelain production was driven by a judicious combination of technical excellence and political will, as illustrated in a special exhibition at the Kyushu Ceramic Museum in Autumn 2012, entitled ‘Shōgun-ke kenjō no Nabeshima, Hirado, Karatsu’ (Porcelain from Nabeshima, Hirado, Karatsu Lords presented to the Shogun). This exhibition featured special Nabeshima, Hirado and Karatsu porcelain presented annually to the Tokugawa shogun’s family throughout the Edo period by these three domains, as required by governmental edict. 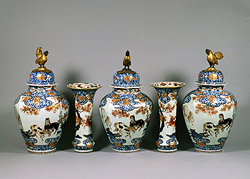 This system forced the local domains to spend a great amount of revenue to produce exceptional ceramics thereby restraining their financial abilities and their potential to mount an insurrection against the Shogun. 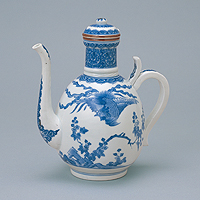 The exhibition illustrated the types of porcelain required by the Tokugawa, the dominant authority of the period, and revealed how the Shogun influenced ceramic production by displaying superior examples of these annual donations.